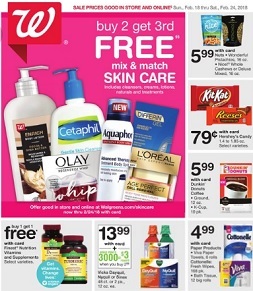 Walgreens Weekly Ad Sale, valid April 21 – April 27, 2019: $5.99 Wonderful Pistachios, 16 oz., Nice! Whole Cashews or Deluxe Mixed, 16 oz. ; $.79 Hershey’s Candy; $5.99 Dunkin’ Donuts Coffee; B1G1 free Finest Nutrition Vitamins and Supplements; $13.99 Vicks Dayquil, Nyquil or Sinex; $4.99 Tide Laundry Detergent; $.75 Bumble Bee Chunk Light Tuna Coupon; $4.99 Nice! 100% Pure Honey or Maple Syrup; 3/$3 Chobani Greek Yogurt; 2/$4 Prego Pasta Sauce; 2/$6 Quaker Instant Oatmeal; 2/$5 Post Cereal; $4.99 Folgers Instant Coffee Classic Roast; $.99 Betty Crocker Homestyle Creamy Butter Mashed Potatoes, 4.7 oz., Nice! Seasonings or Spices, .75 to 3.12 oz., Green Giant Vegetables, 14.5 to 15.25 oz. ; $.99 Campbell’s Soup; 2/$6 Dinner Favorites; $3.99 Edy’s or Dreyer’s Ice Cream; 3/$5 Pringles; 2/$7 Lindt, Godiva or Cadbury Pouch Chocolate; $3.99 Planters Nuts; $1 Smile & Save Cookies; 25% off Living Solutions Appliances; $4.99 Nice! Paper Products; 2/$10 Pet Supplies; and more.